'Mentally Deranged Dotard' Is North Korean Leader's Shot At Trump : The Two-Way In an extraordinary statement released through state media, the North Korean leader says the U.S. president is "surely a rogue and a gangster fond of playing with fire, rather than a politician." 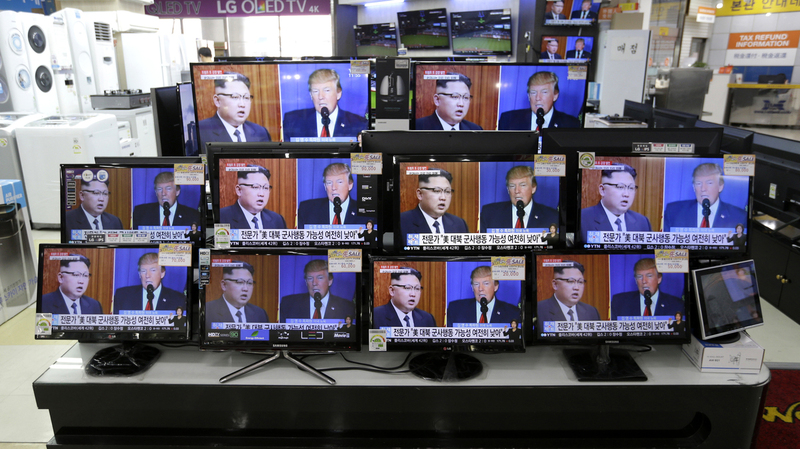 TV screens at a store in Seoul, South Korea, show news coverage of the latest exchange of insults between President Trump and North Korean leader Kim Jong Un. North Korean dictator Kim Jong Un has weighed in on the heightened tensions on the Korean peninsula, with a personal analysis of President Trump's Tuesday speech at the United Nations General Assembly. Trump's speech, which was notable for its apocalyptic rhetoric — it vowed to "totally destroy" North Korea and its 25 million people if the United States had to defend itself and its allies — aroused greater fears of military miscalculation that could lead to catastrophe. Kim, in a lengthy statement released by North Korean state media KCNA, used the first person to respond to Trump's own fiery statements, which is rather unusual and exceptional, says Martyn Williams, a longtime North Korea media specialist who runs the site North Korea Tech. "This is the translation of a direct message from Kim to President Trump. I don't think I've seen anything like this before from Kim Jong Un, and it could be a first for North Korean media," Williams says. In the message, Kim starts off bemused, saying he expected boilerplate talking points from Trump at the U.N. "But," Kim says in the statement, "he made unprecedented rude nonsense one has never heard from any of his predecessors. A frightened dog barks louder." Kim then goes on to lecture Trump, saying he should better read the room and practice prudence when making these types of international speeches, then reminds Trump that the pledge to "totally destroy" a nation state and its people would undermine the very point of the United Nations, which is to maintain global order and peace. "The mentally deranged behavior of the U.S. president openly expressing on the U.N. arena the unethical will to 'totally destroy' a sovereign state, beyond the boundary of threats of regime change or overturn of social system, makes even those with normal thinking faculty think about discretion and composure." "After taking office Trump has rendered the world restless through threats and blackmail against all countries in the world. He is unfit to hold the prerogative of supreme command of a country, and he is surely a rogue and a gangster fond of playing with fire, rather than a politician. His remarks which described the U.S. option through straightforward expression of his will have convinced me, rather than frightening or stopping me, that the path I chose is correct and that it is the one I have to follow to the last." The statement ends with an unspecified threat from Kim Jong Un to make Trump "pay dearly" and "face results beyond his expectation." But we should caution that North Korea's threats on the United States are common and part of its propaganda game. If you read North Korean propaganda daily, Kim appeared reasonably measured, signaling that by saying "I am now thinking hard about what response [Trump] could have expected when he allowed such eccentric words to trip off his tongue." Williams, the North Korea watcher, says he's not alarmed. "[The threats] are par for the course, especially when dealing with a country like North Korea, and the country has made much more explicit threats in the past. I almost wonder if we should be happy that at least they are talking to each other now ... even if it is to trade insults," Williams says. And we should mention that Kim also reintroduces an old English vocabulary word into the American vernacular before he wraps up. "I will surely and definitely tame the mentally deranged U. S. dotard with fire," he says. Dotard, which according to Merriam-Webster means "a person in his or her dotage — "a state or period of senile decay marked by decline of mental poise and alertness." The term is now trending online.